April 1st came and those of us that didn’t requalify for the same Hilton HHonors status we had in 2013 had our status downgraded for the 2014 membership year. A LoyaltyLobby reader had contacted the Hilton HHonors and inquired about getting Diamond status as a one time courtesy for 2014 as he was only 3 or 4 stays short of the new higher qualification criteria. First, we sincerely thank you for your many years of loyalty. As we have previously provided a manual upgrade back to Diamond before in 2012, we are unable to meet your request for a special exception to count your already completed stays toward such a fast track. However, we are happy to extend the special one-time offer to fast track to Diamond tier level. If from today’s date until 30 June 2014, you record 10 eligible stays or 16 eligible nights at any participating HHonors hotel, your account will be automatically upgraded to the Diamond tier status. So, if you had your status downgraded on April 1, 2014, you can contact Hilton HHonors and request a fast track offer that is 10 stays or 16 nights within a three month period. It is disappointing however that the member’s stays as of contacting Hilton (10 stays in 2014) would not be counted if they do decide to opt-in on Hilton’s fast track offer. The regular Hilton HHonors Diamond status match (read more here) is based on nights and requires 21 of them during the same three month period. Hilton has several fast track offers for Gold status that require as few as 4 stays within a 90-day period. You can read more about one of the offers here. I had my Hilton HHonors Diamond status downgraded all the way to Silver and haven’t decided what I will do. 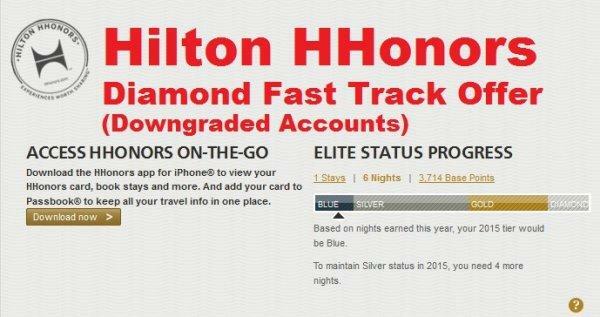 Hilton could perhaps extend a better offer to my account compared to the reader’s one, as I haven’t been matched for years, but have received a Diamond status extension once or twice during the last decade.